Interior design is easy when you add this high quality Safavieh Courtyard area rug to your home. Designed for your hallway, dining room, or living room, this indoor/outdoor piece made from plush synthetic material looks and feels great. This machine-made rug makes long-term decorating easy. Bring this border patterned red rug into your living spaces for a contemporary design aesthetic. Interior design made simple with this contemporary Safavieh Adirondack area rug. Quality meets modern style in this indoor rug made out of plush polypropylene material. The machine-made construction of this area rug is both modern and comfortable. Add this vintage/distressed patterned red rug to the dicor of your home for a contemporary infusion. This modern Safavieh Courtyard area rug will instantly improve any room you place it in. Made from plush synthetic material, this indoor/outdoor rug is high quality and extremely fashionable. This rug is machine-made for convenience and quality combined. Quality is assured with this geometric patterned grey rug. This Safavieh Courtyard area rug adds a touch of modern flair to the design of any area in your home. Add this indoor/outdoor rug to your home for a comfy, yet stylish design option since it is made from plush synthetic material. A durable product is assured with this machine-made rug. Maintain your modern home aesthetic with this geometric patterned blue rug. This Safavieh Courtyard area rug is a great high-quality option for livening up your home. Bring this high quality plush synthetic indoor/outdoor rug into your home to upgrade your interior design immensely. Its machine-made construction is sure to endure the constant treading of feet and furniture. Add this geometric patterned red rug to the dicor of your home for a contemporary infusion. Courtyard Elena Red / Natural 6 ft. 7 inch x 6 ft. 7 inch Indoor/Outdoor Square Area Rug Interior design is easy when you add this high quality Safavieh Courtyard area rug to your home. Designed for your hallway, dining room, or living room, this indoor/outdoor piece made from plush synthetic material looks and feels great. This machine-made rug makes long-term decorating easy. Bring this border patterned red rug into your living spaces for a contemporary design aesthetic. 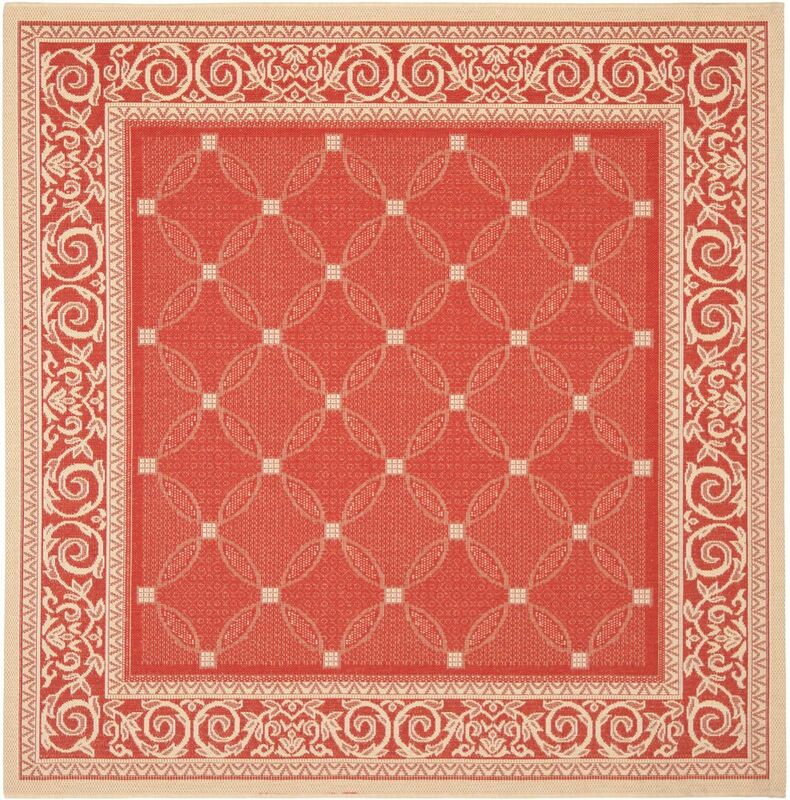 Courtyard Elena Red / Natural 6 ft. 7 inch x 6 ft. 7 inch Indoor/Outdoor Square Area Rug is rated 3.3 out of 5 by 3.